What did she just say, ”cranberry coffee cake for tea?” You are probably thinking that you heard wrong, but you heard correctly. 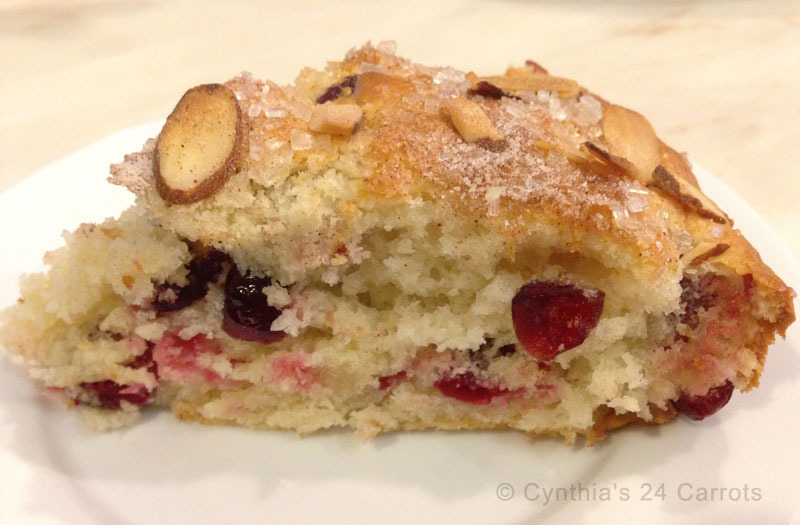 Our version of cranberry coffee cake is just the right addition for our Tea for Modern Times. You can find the recipe at the bottom of this post. We took a traditional coffee cake recipe and put a little spin on it by baking the cake in mini ramekins instead of a standard baking pan. Ramekins are beautiful little baking dishes that happen to provide an ideal manner of presentation for these small scrumptious cakes to serve at teatime. We filled our ramekins just about halfway with the batter and topped them with cinnamon and sugar crystals for sparkle along with sliced slivered almonds to give them some crunch and depth of flavor. Then we baked 8 ramekins on a cookie sheet for approximately 18 minutes at 400°F. The end result was beautiful little cakes ideally suited for an afternoon tea break served along side Earl Grey tea. Our Tea for Modern Times featuring Cranberry Coffee Cake incorporated several stunning pieces of china, glasses and silverware to add a touch of luxury. Our mini cranberry coffee cakes were baked and served in Royal Worcester, Evesham Gold ramekins which match the dessert plates, cups and saucers, as well as our tea pot. The Evesham Gold pattern is still in production having begun in 1961. The complementary water glasses are Fostoria GlassCompany, Dolly Madison (circa 1939 – 1973) and the silver tea spoons and salad forks are Wallace, Grand Colonial (circa 1945 – 2009). We set the table with a rose colored tablecloth and vintage embroidered white napkins in order to frame our afternoon tea service. A dazzling orange begonia plant and deep orange glass votives added an element of seasonal flair to our Tea for Modern Times. These mini cakes baked in ramekins are a wonderful addition for an afternoon tea because they are simply prepared and present beautifully. The most important thing to note about these miniature cakes is that they are enormously delicious! Step 1: In a large mixing bowl whisk together the flour, sugar, baking powder and salt until combined. Step 2: In a medium mixing bowl combine the egg, milk, sour cream and oil with a whisk and set aside. Step 3: In a small mixing bowl toss the fresh cranberries and dried cranberries with the 1 Tbs. flour until all of the berries are coated. Step 4: Combine the wet ingredients with the dry in the large mixing bowl with a wooden spoon just until it becomes a smooth batter. Step5: Add cranberries then pour batter into prepared pan. Step 6: First, sprinkle cinnamon mixture on top of cake then add the sugar crystals. Almonds are optional. Bake at 400°F for approximately 18 – 25 minutes. Cake is done when it is a light golden brown and a wooden pick inserted into the center comes out clean. Enjoy!